Monsoon rains have made its onset in Pakistan started Monday, June 26, 2017 and since then different parts of the country have received precipitation with intervals. Karachi and Hub are the most affected areas where flooding and electrocution has claimed seventeen human lives. Five persons were electrocuted in different parts of Karachi city and two children drowned in a pond, while nine people including two children died due to heavy rains in Hub and Lasbela areas of Baluchistan. Flash floods have also swept away several houses in Hub, Baluchistan. In Khyber Pakhtunkhawa and Gilgit Baltistan intermittent rain was witnessed in various regions, out of which Chitral, Lower Dir, Bajaur, Shangla and Upper Dir saw minimal rain while Attar Pak saw received the heaviest spell. One boy lost his life in Chitral in rain related incidents. Rain-thundershowers with gusty winds may occur at scattered places of Hyderabad, Karachi, Mirpurkhas, Tharparkar, Shaheed Benazirabad division, and at isolated places of Islamabad, Rawalpindi, Gujranwala, Lahore, Malakand, Hazara, Kohat, Bannu, D I Khan, Kashmir and Gilgit-Baltistan. There is risk of landslides in hilly areas of upper Khyber-Pakhtukhwa, Malakand, Hazara, Gilgit-Baltistan and Kashmir. Community World Service Asia Response: Community World Service Asia will monitor the situation and will try to get updated information from different stakeholders. Its emergency response teams are ready and will be deputed immediately if the need to respond to the crisis arise. The ongoing flood emergency is continuing to adversely affect the lives and livelihoods of thousands of communities all across Pakistan and its AJK state. The rains that started in the mid of July have continued for weeks disrupting the lives of many communities. The National Disaster Management Authority (NDMA) have reported 917,791 people as affected; 173 deaths and 127 injuries owing to the devastating floods. In Sindh, the rainfall leading to floods has affected the Katcha area of the six districts however it is anticipated that the floods will drift down to the low lying districts of the province as well. Government authorities have predicted an increase in flooding particularly in Sindh in the upcoming days as heavy monsoon rains are continuing, thus increasing flood water levels in Kabul, Indus, Jhelum and Chenab rivers. The persistent melting of glaciers in Diamer district are further adding to the rise in river waters. The authorities have warned of massive destructions in interior Sindh in the coming weeks when flood water from all of over the country is expected to pass through catchment districts of Indus River in the Sindh province. 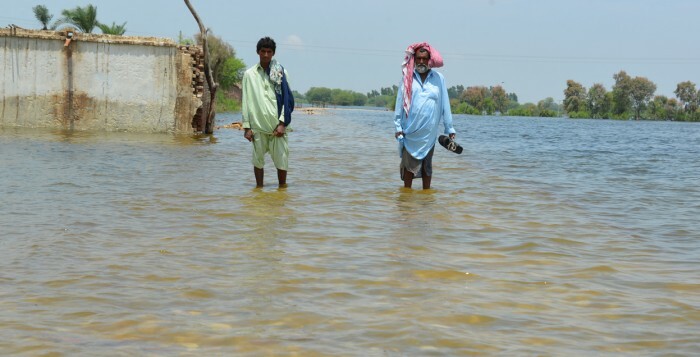 Sindh: Six districts have been severely affected by the floods in Sindh so far and the number of the affected villages is expected to increase rapidly in the following days. The affected districts in Sindh include Kashmore, Gothki, Shikarpur, Khairpur, Sukur and Qambar Shahdadkot. The displaced communities have no choice but to live in tents under open skies on embankments and elevated areas in the affected districts. Anticipating displacement from these districts the government has established relief camps at various embankments. Khyber Pakhtunkhwa: Eleven districts of the KPK province have been affected by the floods and a lot more damage is expected in the near future due to the unending monsoon rains, land sliding, melting of glaciers and increase in flood level in Kabul and Indus rivers. The affected districts in KPK include Bannu, Batagram, Charsadda, Chitral, DI Khan, Karak, Kohat, Lakki Marwat, Peshawar, Swat and Shangla. However Nowshera and Charsadda are at a higher risk because of the mounting pressure being caused in Kabul River due to the continuing rains. Gilgit-Baltistan: Diamer, Gilgit, Ghizar, Ghanche, Skardu and Hunza districts have been reported to be severely damaged. A number of roads and connecting bridges have been washed away leaving many villages disconnected from the main towns. AJK: District Sudhnoti, Neelam, Havaili and Bhimber have been reported to have been affected by the rains and flash floods in 17 villages in the region. Punjab: Almost 500 villages in Mianwali, Layyah, DG Khan, Rajanpur, Rahimyarkhan and Muzaffargarh districts are left inundated by the floods. Agricultural land spread across 378,172 acres of land have also been destroyed. Baluchistan: Heavy rainfall, windstorms and the inevitable floods have left districts Zhob, Musakhel, Killa Saifullah, Kohlu and Dera Bugti severely damaged; flood protection bunds, electricity poles, roads, plantations have been impaired. The floods have caused breaches at various locations in the protection bunds claiming four lives so far. FATA: A number of villages and houses have been reported as damaged in the Khyber and Mohmand agencies of the Federally Administered Tribal Areas. However, exact figures are yet to be reported by the authorities and the national media. Response by Act Alliance: Community World Service Asia’s project teams are present in KPK, Sindh and Punjab provinces as well as in Azad Jamu & Kashmir. Sindh, positioned on the tail-end of Indus River, is one of the most flood-prone provinces. A number of districts in Sindh are already affected and the thousands of people displaced are in need of food, non-food items (NFIs) and health assistance. 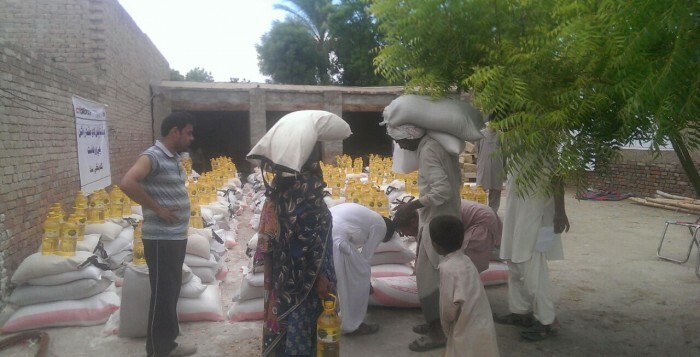 Community World Service Asia’s team in Sindh has carried out assessments and has also completed the distribution of monthly food packages to 100 flood affected families. The assistance is to be continued as 2,221 additional families will receive monthly food packages in the coming weeks. Community World Service Asia will also establish a water treatment plant in district Ghotki which will provide treated, clean drinking water to approximately 5,000 flood affected people on a daily basis for a month. Provision of Emergency Health Services has also been proposed in district Ghotki. 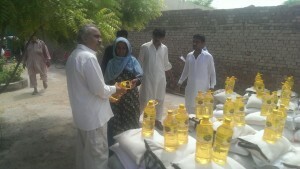 Our partner, NCA’s WASH team have also completed an assessment in Punjab and Sindh. In Sindh province, NCA has jointly assessed the situation in district Ghotki together with Community World Service Asia focusing on WASH, health and livelihoods. NCA’s assessment covers Layyah, Muzaffargarh and Rajanpur districts in Punjab province and Ghotki, and Kashmore districts in Sindh province. The assessment team has conducted a rapid survey using semi-structured questionnaires, key informant interviews, FGDs and interviews with government stakeholders to gather important information on access, vulnerability, coping capacity, available resources and existing key risks. The assessment has been compiled. As part of NCA’s emergency preparedness plan, the organization is mobilizing its pre-positioned mobile Water Treatment Units (WTUs) for immediate use. Each unit can purify and provide clean drinking water to 5,000 individuals based on SPHERE standards. Keeping in view the urgent needs and NCA’s life saving response capacity, it is utilizing its internal funds (through their head office) to provide emergency funds to immediately mobilize the WTUs. As planned for this response, six WTUs will provide water to alteast 30,000 individuals at this crucial stage. The budgeted amount is calculated for a three months response. The floods have also severely damaged the infrastructure and local livelihoods of many parts of rural and semi-urban Pakistan; agricultural fields and crops have been damaged. A number of local markets, link roads, connecting bridges and micro-hydro power stations have been reported damaged as well. As per the latest reports of the Pakistan Meteorological & Hydrological Department, the River Indus at Guddu Barrage is likely to attain a High to very High flood level ranging between 650,000 cusecs to 750,000 cusecs during 1400 PST of August 1st to 2400 PST of August 3rd 2015. It was further added that the flood levels will continue to remain high for the following seven days. River Indus at Sukkur is also reported to maintain a High to very High flood level ranging between 650,000 cusecs to 750,000 cusecs during 1200 PST of August 2nd to 2400PST of August 4th2015. Flood levels will remain high for the next seven days in this region as well. 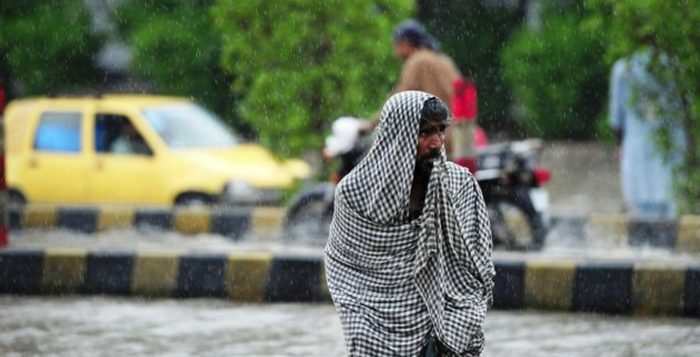 Unceasing heavy monsoon showers are expected in the coming days across Pakistan and a further increase in the water levels in Kabul, Indus, Jhelum and Chenab Rivers may intensify the flooding in Sindh. The Director General of the Meteorological Department still maintains as per his earlier message that India is also likely to release excess water from its dams in the following days which can upsurge flooding in the low-lying areas of Pakistan also. 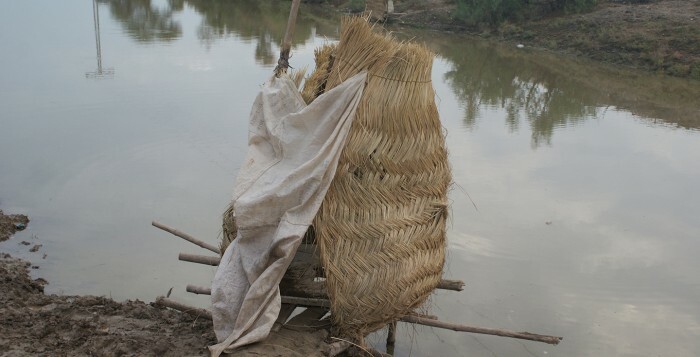 The authorities have warned of massive destruction in interior Sindh in the subsequent weeks as flood water from all of over the country will pass through catchment districts of Indus River in the Southern province. * No definite number available yetThe affected communities displaced are forced to live in tents and under the open sky or on embankments and elevated places in the affected districts. The government has established relief camps at various embankments for the affected people however people have been reported to prefer to live in open spaces instead. The provincial government together with the Pakistan Army is providing rescue and evacuation services to the flood affected communities and villages. * No definite number available yetChitral is the worst affected district in KPK province. Majority of the villages have lost land-connections that they had between major cities as link roads and connecting bridges, micro-hydro power stations have been severely damaged. The Government has distributed relief items including tents among the displaced families and has also announced a cash compensation of PKR. 0.5 Million for each affected family that has lost their house in the floods in Chitral. * No definite number available yetGhizar, Astor, Skardu and Hunza districts have been reported to be severely damaged. A number of roads and connecting bridges have been washed away that has left many villages disconnected from the main towns. * No definite number available yetDistrict Sudhnoti, Neelam, Havaili and Bhimber have been reported to affect by the rains and flash floods. Villages in Mianwali, Layyah, DG Khan, Rajanpur, Rahimyarkhan and Muzaffargarh districts are most severely swamped by the flood water of River Sindh. Out of the total affected population in Punjab, 59250 are reported to be living in 27 relief camps established by the Government. Crop fields spread across 233,688 acres of land have been totally destroyed. * No definite number available yetHeavy rainfall, windstorms has affected Districts Zhob, Kohlu and Dera Bugti with flooding. Flood protection walls, electricity poles and links roads have been damaged while trees and plants have been uprooted as well. High flood levels in Guddu and Taunsa barrages are posing a probable threat to more districts of Baluchistan. A number of villages and houses have been reported to be damaged in Khyber and Mohamand agencies of Federally Administered Tribal Areas. However, exact figures have yet to be reported by the authorities and national media. Response by Community World Service Asia: Community World Service Asia’s Disaster Response Team are present in KPK, Sindh and Punjab provinces as well as in Azad Jammu & Kashmir. Sindh, positioned on the tail-end of Indus River, is one of the most flood-prone provinces. A number of districts in Sindh are already severely affected and thousands of people are in dire need of immediate food, NFI and health assistance. 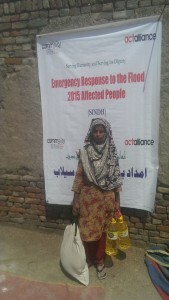 Community World Service Asia has been able to assist 100 most vulnerable flood affected families in district Ghotki with provision of one month food rations. 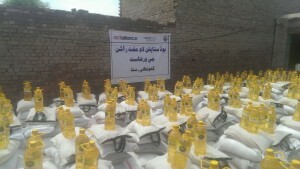 One month food ration among another 827 families will be distributed in the coming weeks. Heavy monsoon rains hit different parts of Pakistan starting the third week of July and are still going strong. These rains along with rapid melting of glaciers have resulted in massive flooding across the country. Till date, 145 people have been reported to have died, while 36 people have been injured because of this heavy downpour and floods. Three thousand and fifty houses are damaged and 451 villages have been totally inundated while many more villages have been partially affected resulting in the displacement of around 3, 85,957 people across the country. These latest floods have also severally damaged the infrastructure and the local livelihoods. A total of 715 cattle have perished in the floods, and 233,688 acres of agricultural land, local markets, roads, bridges and micro hydro-power stations have been damaged. The Government authorities have predicted an increase in flooding especially in the Sindh province in the upcoming days due to the continuing rains, increase in flood water level in Kabul, Indus, Jhelum and Chenab rivers, and the further melting of a glacier in Diamer district. According to the Director General of the Meteorological Department, India has also released 150,000 cusecs of flood water which means 0.8 million cusecs of water is currently passing through the Guddu Barrage. India is likely to release more surplus water from its dam in the coming days which will further increase flooding in the low-lying areas of Pakistan. The authorities have warned of possible massive destruction in interior Sindh in the following weeks as flood water from all of over the country will be passing through catchment districts of Indus River in the province. Sindh: 16 people have died because of rains and floods and many more have been reported injured as of today. Six districts and over 300 villages have been affected by the floods in Sindh so far and many more villages are expected to be gravely affected in the days to come. The affected districts in Sindh include Kashmore, Gothki, Shikarpur, Khairpur, Sukur and Qambar Shahdadkot. Over 100,000 people have been displaced and are forced to live in tents and under the open sky on river embankments and elevated places in the affected districts. Anticipating displacement from these districts the government has established relief camps at various embankments in Sindh. The provincial government together with 800 personnel from the Pakistan Army is providing rescue and evacuation services to the people from the flood affected villages. Hundreds of people currently living in the open air and under tents are at risk of being highly food insecure. Khyber Pakhtunkhwa (KPK): Three districts and 292 villages have been affected by the floods in KPK where 74 people have died and 15 have been injured so far. Many more damages are expected to follow in the coming days because of the continued monsoon rains, land sliding, melting of glaciers and increasing water levels in Kabul and Indus rivers. The affected districts in KPK include Chitral, Peshawar and Shangla while Nowshera and Charsadda are at high risk because of mounting pressure in Kabul River and continued monsoon rains. Chitral is the most affected district where 64 people have died and 31750 houses have completely washed away with the flood water. Majority of the villages have lost land-connections with the major cities because of destruction of roads and connecting bridges and micro-hydro power stations. 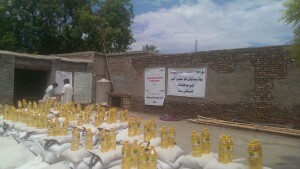 The Government has distributed relief items including tents among the displaced families and have also announced PKR. 0.5 million in cash for each family that have lost their homes due to the floods in Chitral. Gilgit-Baltistan: Ghizar, Astor, Skardu and Hunza districts have been most damaged in this region. Six hundred and twenty five houses have reported to be fully damaged while many more were reported to be partially damaged as result of rains, landslide and flashfloods. Two people have been reported to have died because of rains/flash floods in this area. A number of roads and connecting bridges have been washed away that had left many villages disconnected from the main towns. AJK: Districts Sudhnoti, Neelam, Havaili and Bhimber have been reported as worst affected by the rains and flash floods in this region. Thirteen people were reported to have died while eight have been injured and a hundred houses were reported as fully damaged. Punjab: At least 31 people have died and 4 people have been reportedly injured as a result of the floods and vicious rains in the Punjab province. Four hundred and thirty three villages in Mianwali, Layyah, DG Khan, Rajanpur, Rahimyarkhan and Muzaffargarh districts are left flooded by the overflow of water from the Sindh River. 285,957 people have been reported affected out of which 59250 are living in 27 relief camps established by the Government. Agricultural fields spread across 233,688 acres of land have also been destroyed. Baluchistan: Heavy rainfall, windstorm and the flood situation in District Zhob has damaged flood protection bunds, electric poles, roads, uprooting trees, etc. The floods have also caused breaches at various locations of the protection bunds claiming four lives so far. In the central province, at least twenty-one people drowned in the flood water, however, only seven dead bodies have been recovered. The search and rescue operation is underway for the recovery of the rest of the drowned people. FATA: A number of villages and houses have been reported to have been fully damaged in Khyber and Mohamand agencies of Federally Administered Tribal Areas. However, exact figures have are yet to be confirmed by the authorities and national media. Response by Community World Service Asia: Community World Service Asia’s field teams are present in KPL, Sindh and Punjab provinces as well as in Azad Jamu & Kashmir. 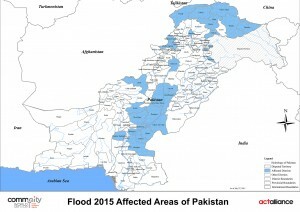 Sindh, positioned on the tail-end of Indus River, is among the most flood-prone provinces. A number of districts in Sindh are already affected and thousands of people are displaced who are now in dire need of food, NFIs and health assistance. Community World Service Asia’s field team in Sindh is carrying out assessments in the affected districts and has also started distribution of one month food rations to hundred most affected families in Gothki district of Sindh province. 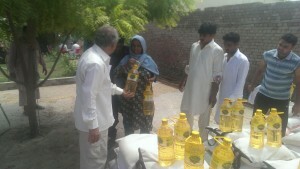 Another one month food rations among another 827 families will be distributed in the coming weeks. The Pakistan Meteorological Department (PMD) on Sunday predicted heavy rains in Khyber Pakhtunkhwa (KPK), northeastern Punjab and Azad Jammu and Kashmir (AJK) during the coming week. Heavy rains forecasted within the next 24 hours in Malakand, Makran, Kalat, Gilgit-Baltistan and Kashmir are to be accompanied by powerful gusts of wind. Rainfall of up to 200 millimeters (mm) may occur in these areas within the next 24 hours. The normal rainfall for Pakistan’s monsoon season is usually expected to be around 141mm, while this expected rainfall of up to 200 mm (which is 42 % above the normal range) could cause flooding. The trend analysis of the rainfalls in Pakistan for the last four years indicates that the average rainfall from 2011 to 2014 had gradually decreased however the current expected rainfall of 200 mm may change the trend again. This anticipated changed pattern may generate high level flooding in the target areas. 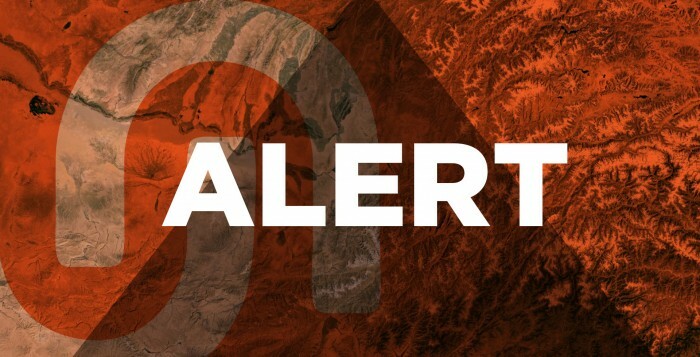 Excess rainfall in the Kabul River catchment area along with the snow melting may also cause flooding along connected riverbanks. Moreover, the deep depression over the east central Arabian Sea has intensified further into a tropical cyclone which is likely to move north-westward in the next 24 hours. Under the influence of this system thundershowers are expected in Karachi, Hyderabad, Mirpurkhas, Tharparkar, Thatta, Badin and Sujawal districts of lower Sindh in the next 24-48 hours and in southern Baluchistan in the next 36 hours.